ATTENTION: You have found the old NDC site. Please proceed to our NEW HOME: http://nationaldreamcenter.com/ Thank you for visiting! I assume the reader has already seen the biggest headline in recent American news. We will inspect the dream statistics in the post to see how and when the collective unconscious “saw” this particular headline and to figure how to bolster our operations here. 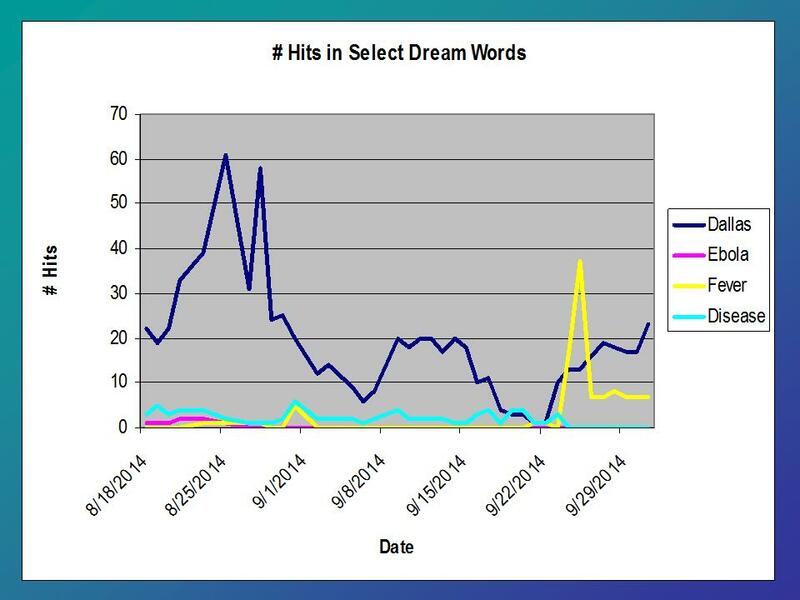 This chart represents the number of hits of various words in the collective dreams. Typically all four of them produce very low returns and even hardly ever pop up past 10 hits. They just aren’t very popular words in the hundreds and thousands of dreams in investigate. And that’s why looking at trends is a huge help to the growing field of DreamForecasting (it’s growing because as of recently we have 3 aspiring participants learning the ropes of creating headlines). But getting back to the graph, particularly the blue line, clearly, the collective unconscious “saw” something in Dallas with that incredible surge of hits about 5 weeks prior to our recent real-world ebola headline. Interestingly, the yellow line (Fever) was the only indication I could find for a predictive illness connected to Dallas. I’ll explain all that later. We’ll discuss the chart first and then look at the overall timeline. Starting with Point A, this is where Dallas started. It popped up on the DreamBot 2 and 3 runs, but not DreamBot4. At Point B (3 days later), Dallas surges so much more that it shows up in DreamBot4. Interestingly, it shows up in DreamBot4 AFTER it came out in 2 and 3. You see, DreamBot4 is all about daily surges, not longer term trends. So, if it is surging AFTER it was already in a heightened state in 2 or 3…well, that is just really special. We knew this on the 21st, so we quickly hastened the formation of Paradigm 1 dreamers and began incubating for Dallas. As you can see from the chart, Dallas continues to escalate, but it falls off the DreamBot4 because it’s percentage climbs are slowing here (even though it looks like acceleration to its peak on the 25th. So, at Point C, we’re keeping an eye on it, because this is really unusual. I mean REALLY unusual! As for the rest of the blue line, Dallas eventually drops to zero and then begins climbing again just before the big ebola headline in Dallas on 30 September 2014. Point D: Interesting how “Fever” and “Disease” both do a mini-spike at exactly the same time. This points us to the advantage of clustering our dream results, but that will be in another post. 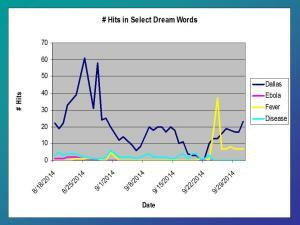 Point E: Dream word “Fever” spikes big and appears at #1 on the DreamBot4 on 25 September. Point F: The blue line again (Dallas) just showing the insidious climb, which would never show up on a typical DreamBot4. Therefore, a new DreamBot is born, but it’s only a concept for now. More on that in a later post (if I ever get around to creating it). Point G: Dream word “Disease” is not a popular word, but it is rarely ever ZERO. I find it quite interesting that “Disease” drops to ZERO while “Fever” skyrockets. One of my favorite theories here is that Ebola is more of a fake disease while the Fever is real. In other words, the so-called “Disease” was created, but when contracted, causes a real Fever. Just another unprovable hypothesis. One more thing of note: The only time you see pink in the chart (Ebola) is right when Dallas is surging like a rocket. I find that interesting, and the big question is…why isn’t Ebola seeing more and more hits altogether? If nothing else, it’s day residue from getting pounded by the media on Ebola in Africa. Perhaps it reached a saturation point and people stopped dreaming about it altogether. OR maybe this isn’t Ebola…conspiracy minds like to think openly. Is this Dallas headline a hoax of some sort? Sort of rings of the Point G idea, but could also point to the notion that dreams have no connection to reality. Uh, sorry…can’t buy that one because of our track record thus far. Any other ideas? Go here and post in our discussion. April 27, 2014: “To vaccinate or not.” PA dreamer describes a quarantine area based on a spreading illness and hears English and Spanish speakers. That was outlined in PA Report 5. August 18, 2014: A city makes its first appearance into DreamBot4 (locations and names are rare in DreamBot4 surges). August 19, 2014: DreamBot2 and 3 indicates that Dallas is hot. In this inspection, some interesting phrases came forth, but nothing particularly illness- or virus-related. All three of the predictions came true, except there are some residual headlines still untapped under headline #2. We questioned….are those yet to come, or is the chaos fulfilled? We didn’t know, so we sent this back to P1 for processing (i.e. incubation). We continued incubated because this was but a temporary headline. Since the dreamers came up empty in relation to violence and chaos, I canceled the pending red alert . September 14, 2014: “Red Alert now cancelled for September.” We continued incubating dreams for one week after the 6 Sep Initial Headline. During that week, the only big meme that arose was “Covered in White.” When the ebola pictures came out from Africa with doctors and medical personnel in all white, we dropped the connection between Dallas and the incubated “Covered in White.” I specifically mentioned that the cancellation of the red alert was only in reference to the next two weeks, and could be back in October. WOW, talk about close call on the timing! Based on what we know now, our August and September Dallas incubations were seeing the bushes that were closer to us than the big ebola tree. The bushes were directly blocking our view of the huge oak tree in the distance. If we measure bushes and trees in terms of headlines, I can’t see anyone arguing that the Dallas ebola was the definite big oak on the horizon. We can also overlap this with another lesson from Proj August, which warned us that the most accurate dream incubation/predictions were those that manifested within one week. Therefore, incubations for big surges like this really do need to happen week by week if they haven’t come true. This could be the biggest takeaway for P1 dreamers (and now they’re all reading this sighing, “oh no, not more incubations!”). In essence, BIG spikes from DreamBot4 could be medium-sized bushes in the near future or BIG headlines in the distance. To keep tabs on this, we keep dreaming. Aside: We need more dreamers so that we can get more overlaps (higher accuracy) and fomulate a complete schedule for folks so they don’t get overworked and quit from exhaustion. How paradoxical is that…the work happens in sleep, so why is this work so exhausting? You have to try it to know. First off, it takes time to input the dream, even more to analyze it (the DreamReaders, DFs, and P1 does this), and even more time to develop the real-world headline (DreamForecasters do this). I don’t mean to be splitting hairs here, but technically, September 30th was just outside of those 2 weeks mentioned in the red alert cancellation, but I won’t push that nuance on the readers. Regardless…Dallas WAS big after all. The collective unconscious saw the WHERE about 6 weeks ahead of time. 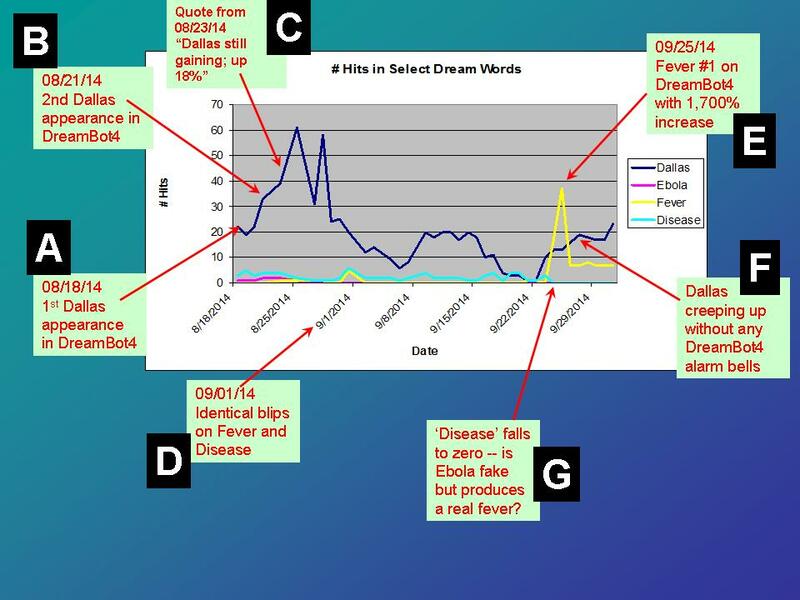 The WHAT component was totally in our face about 5-6 days prior the news with FEVER surging 1,700% on DreamBot4. Was I incubating Dallas? No. So how was there any way of connecting Dallas, Fever, and September 30th? Answer: Paradigm 3’s P1 team. The biggest news in all this Dallas and Ebola business is that we had all the pieces ahead of time, but were unable to assemble them correctly because of several different poignant issues impacting our operation, from health, forum attacks, forum collapse, and a lack of dreamers and DFers. We’ve resolved a couple of those issues, but more people would be a great help here. We’re asking for dreamers, creators/manifestors, DreamReaders, and some more DreamForecasters. After this Dallas meme statistical expose, we could also use a DreamAnalyst… Bottom line…won’t you please help us get the Paradigm 3 operation beefed up? Finally, comments are welcome in this forum: http://nationaldreamcenter.com/forum18/showthread.php?tid=60 Please come join us! Don’t miss our daily DreamBot run which shows a brief status of the collective unconscious. Copyright © 2014 Chris McCleary. Except for quotes, all rights reserved and any reference about this material requires a link back to this page. Are you a Dreaming Prodigy? For those with eyes to see: Secret mirror to Wall St.
Yellow Caution: All Eyes on Hawaii! Project Año: Biggest Initiative to Date! Jung’s ‘Secret Order’ Becoming Revealed! Barry the Rabbi Busted! Incredible Linguistics Breakthrough! DreamBot predicted the coming SuperTyphoon!